The Tong Peal experience for producing quality vegetable washing equipment has existed for almost twenty five years. Illustrated here is the barrel of a typical washing machine. 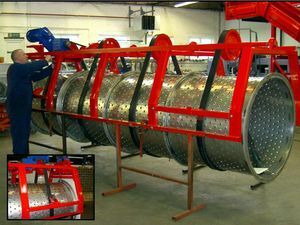 Manufactured in perforated stainless steel with heavy duty support rings is the heart of the machine. The barrel is suspended on a heavy duty triple vee belt and has rubber tubing bolted to the inside which turn the crop and move it through the barrel. It is this gentle turning which causes the crop to rub together in the water and creates the good cleaning. Strong pulleys (see inset) hold the barrel in-line and prevent any lateral or longitudinal movement. The fixed speed motor powers the driveshaft which has heavy duty triplex pulleys.